One of the great benefits of the retirement village lifestyle is you can easily do both – work and play! With many retirement villages now catering to over 60’s, more of these ‘young ones’ are choosing to enjoy a relaxed lifestyle while still working full-time or part-time. They are joining those in their 60’s and even 70’s who continue to work a little while enjoying the spoils of retirement village life. Here are some of the benefits of retirement village living, if you don’t have plans to quit working any time soon! Retirement village living comes in all sizes. For instance, you might be looking to downsize from a large family home to a more manageable one. If you’re working full-time while trying to care for a large home, you may be grateful for a smaller space. Or perhaps you might be looking to step up from a small flat or unit into a more spacious villa. Either way, the choice is yours – and the great part is, with retirement village living comes so much more than just a place to call home. How much time could you save if someone else handled the maintenance of your lawn and yard? Many retirement villages look after the maintenance of areas around your villa and the cleaning and upkeep of shared spaces. Your monthly fee even takes care of the payment of council rates. Whether you’re working or not, of course you’ll want to be close to health services. Look for a village with an on-site doctor as a ‘must-have.’ You may also find retirement villages with visiting practitioners such as a podiatrist, physiotherapist, or massage therapist. Also think about the proximity to other health service providers such as a dentist or optometrist – and don’t forget to look for a vet close by for your little mate! One of the great advantages to choosing a retirement village is the resort-like facilities on offer. You can choose to relax by the pool, or invite guests for dinner under a gazebo. You may also find that some villages enable you to book a function room for hosting a private party. That’s one less need for a large lounge room or a big back yard! Look for a retirement village that’s conveniently located near a shopping centre, to save you time and make it easy to grab your groceries on the way home from work. If it’s within easy walking distance, that’s even better! Add in a range of eateries, a pub or a club, and you’ll have a handy spot to meet with clients, work associates – and friends of course! Everyone wants to feel safe in their own home. And it’s also important to know that while you’re out at work your home is safe. A secure retirement village will give you peace-of-mind 24/7. Check what security is provided when you’re researching villages. 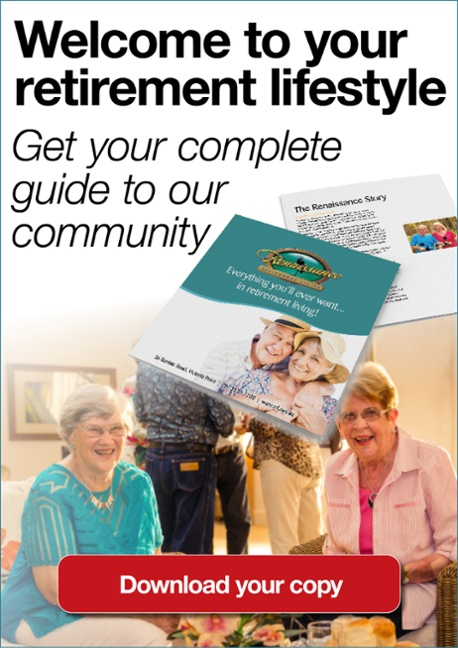 One thing you’re sure to find in retirement village living is a sense of community. Knowing everyone is either retired or heading in that direction provides common ground that you can build meaningful friendships on. Living in a village means becoming part of a vibrant community of people who enjoy life and all it has to offer; residents who look out for one another and actively work towards the overall spirit and harmony of the village environment. You also want to know there’s a professional management team on board. When you’re at work, you need to know things at home are taken care of. Some retirement villages today are like living in a resort, offering a host of facilities and daily activities. After all, even if you’re working you’ll still need some down time! Modern centres feature a pool, spa, and gym. You might also find billiards, croquet, lawn bowls, yoga, exercise and tai chi classes, or even be offered day trips to interesting destinations. And there’s usually an array of night time entertainment to enjoy over a meal and drinks with friends. With so much to do, you might end up considering retirement sooner rather than later! 9) A little peace and quiet to enjoy! If you commute to work, have a stressful job or own a business, it’s great to know you can come home and relax. That’s where it makes sense to look for a retirement village that’s located near green space – whether that’s bushland, lakes or the ocean. You can unwind with an evening stroll, ride along bikeways, or simply find a spot surrounded by nature for a little ‘you’ time. Renaissance Retirement Living at Victoria Point offers the perfect lifestyle for over 60’s who want to continue to work. We understand you want your independence and the freedom to come and go. You’ve worked hard and now it’s time to enjoy some of the pleasures of retirement living in a resort style village such as Renaissance. Today’s retirement villages are no longer just a stage before moving into a nursing home. Far from it! In fact, you might notice an improvement in your health and wellbeing once you move in. It may have something to do with the relaxed environment, having everything you need close by, or living right next to nature. It also helps to not have garden maintenance to worry about! Renaissance Victoria Point might just offer the lifestyle you’ve been dreaming of.